Perrycroft is an Arts and Crafts house designed by the architect C F A Voysey and built in 1895. Perrycroft represents an Edwardian ideal, a dream house set in the magnificent scenery of the Malvern Hills, graced with a charming Lodge, and with stables and coach house around a small courtyard, all designed by Voysey to complement the house. 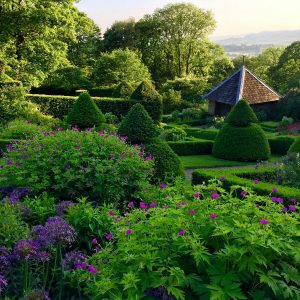 Today Perrycroft stands remarkably untouched by time, a romantic and secluded haven high on the west side of the Malvern Hills with magnificent views over rolling Herefordshire towards Wales. Perrycroft has been our family home since May 1999. Since then it has been our delight and privilege gently to restore the house and bring the gardens back to life. It is with great pleasure that we invite visitors to share with us this very special place. The House and Garden are open for Open Days in Spring, Summer and Autumn, and for groups by appointment. Visitors are also invited to stay in the tranquil grounds of Perrycroft, in one of our three holiday cottages. Garden Cottage was formerly the gardener’s house, and sits on the edge of the garden with direct access on to the Malvern Hills. 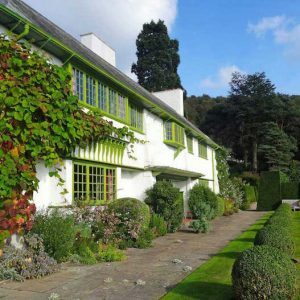 The Lodge at the top of the drive is a Voysey cottage, and we offer a rare opportunity to stay in a house designed by this important Arts and Crafts architect. 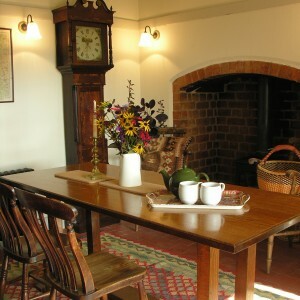 The Old Stables is part of the original Voysey designed stable yard, and makes a peaceful family friendly base from which to explore the Malvern Hills. We look forward to welcoming you to Perrycroft.